This bright & airy 1600 sq ft condo shows like a model. Building was a condo conversion in 2003. Check out the room sizes on the attached floor plan! 3 spacious bedrooms; huge Living Room offers such architectural details as crown molding and lovely decorative fireplace flanked by built-in nooks. Separate Dining Room can easily handle a table to seat 10 people. Kitchen features 42" cabinets, granite countertops, Breakfast Bar, stainless appliances and brand new dishwasher. Nicely updated bathrooms. Gleaming hardwood floors throughout. Other highly desirable benefits include in-unit Washer/Dryer, Central Heat & A/C, and 1 garage space included in price. Great storage inside the unit as well as dedicated garage shelving. Fenced yard with shared garden space. 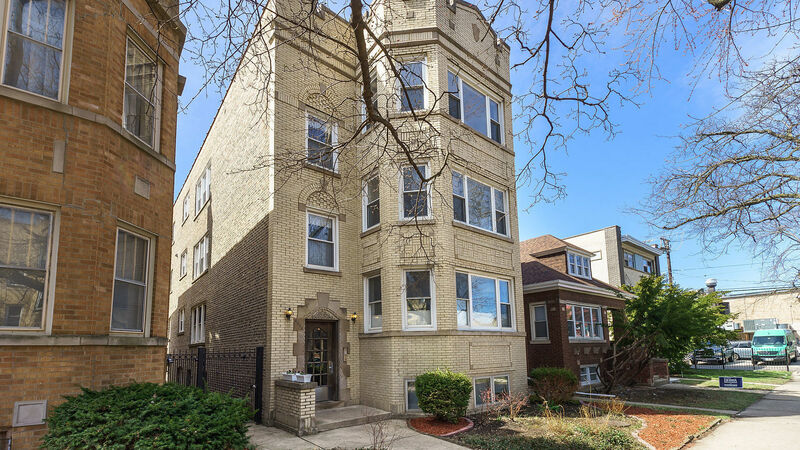 Located in a vibrant neighborhood with restaurants, shopping and transportation, as well as CPS Level 1+ Clinton Elementary School. This spotless unit is move-in ready and waiting to welcome its new family!